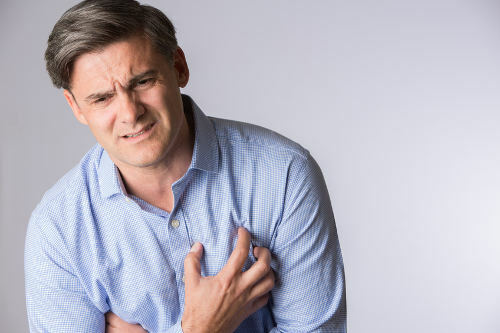 Chest pain is a fairly common complaint, and it comes in many different types and causes. If that pain takes the form of tightness in the chest (constriction, pressure, squeezing, etc.) then this suggests that the cause may be connected to your heart somehow. Obviously, your heart is not supposed to be hurting you, but there is no one set reason why this symptom might appear. By understanding more about what can cause tightness in the chest, you can hopefully make more informed decisions about your well-being. What Causes Tightness in the Chest? Physically straining yourself causes the heart to beat faster in order to keep pace. Depending on the state of your arteries, blood vessels, and health in general, this can result in temporary bouts of chest pain. The likelihood of this happening goes up if you are exerting yourself in extreme temperatures or following a heavy meal. Angina is the term for heart pain and it is specifically caused by a narrowing of the coronary arteries. This narrowing is due to the gradual development of fatty patches (plaques) along the interior lining. These obstructions limit how well blood can flow into the heart, and the pain is the result of the heart struggling under the reduced blood flow. A heart attack happens when blood flow is cut off to part of the heart and portions of the muscle begin to die. It should not need explaining why this is a bad thing. The most common cause of a heart attack is a blood clot and, if medical attention is sought quickly, it can be resolved by removing the clot and restoring blood flow. Heart attacks have a few telltale symptoms that those at risk need to be watchful for: severe chest pain when at rest (“heavy pressure”), shooting pains through the jaw or arm(s), faintness, shortness of breath, or feeling sick. If you have experienced angina, the pain will be similar but worse and longer-lasting. High blood pressure can strain the heart over time and cause a thickening and growth of some of the heart muscles. This condition is known as left ventricular hypertrophy (LVH). This enlargement can end up compressing the coronary arteries and lead to angina-like chest pain, shortness of breath, pain in the neck, back, arms, or shoulders, and fatigue. This is another possible complication from hypertension and, as the name says, affects the right side of the heart. As the right ventricle gets enlarged from the strain, it can get pushed past its limit and end up failing. Initially, the symptoms of cor pulmonale are similar to what you might feel after a period of exertion: shortness of breath, tiredness, lightheadedness, and a raised heart rate. As the condition advances and blood starts failing to get through to the lungs, you can then develop chest pain, swelling in the legs or feet, wheezing, an excessive cough, and fainting spells. This is the term for an abnormally fast heart rate. The average adult heart pumps at around 60-100 beats per minute (bpm). In tachycardia, this rate is either above the 100 bpm measure or very close to it. Faster beating leads to less efficient blood flow, and the faster pace also increases the oxygen needs of the heart. Although it can sometimes appear with no symptoms, tachycardia will still significantly raise the risk of a stroke or cardiac arrest (when the heart simply stops beating). When it does cause symptoms, tachycardia can cause angina pain, rapid pulse, confusion or dizziness, shortness of breath, fainting, and a racing feeling in the chest. Tachycardia can be the result of both chronic (heart disease, hypertension, etc.) or short-term (drug use, reaction to medicine, etc.) causes. Since it is a symptom, tightness in the chest’s only treatment is to resolve the underlying cause. For some causes, such as tachycardia or angina, lifestyle changes may be required. For exertion, often a period of rest is all you need. If the case is myocardial infarction, then you need to get medical attention immediately. Chest pain should not be underestimated, especially if it comes with tightness in the chest. Tightness means that the heart is involved and the causes have a lot of overlapping symptoms. Any sudden onset of chest tightness needs to be reported to your doctor. If that pain is accompanied by swelling, fainting, shortness of breath, or any other symptom of a heart attack, then you need to seek emergency medical help at once.